What is a good video watermark pro? A great watermark software must have those features: easy operation, powerful and full function. 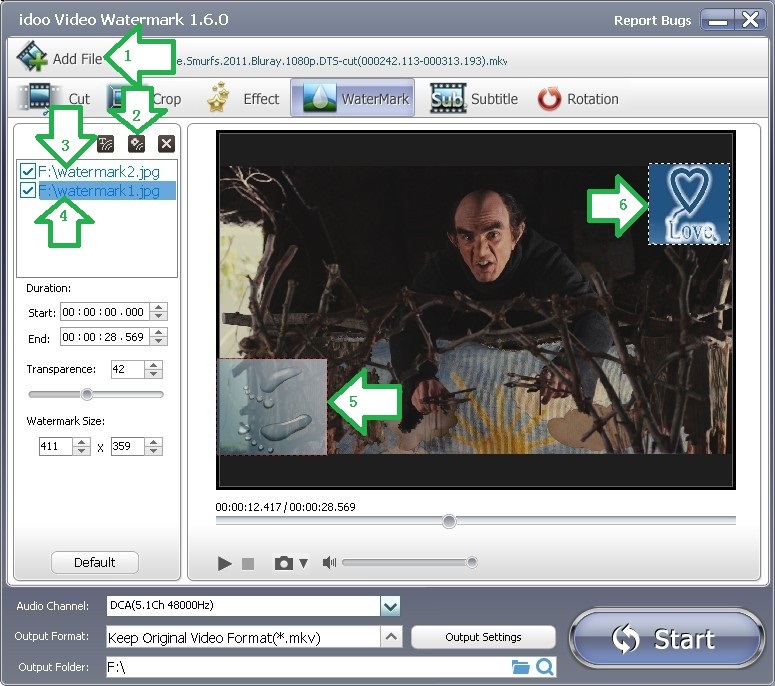 Little watermark software satisfy all those demands, however idoo Video Editor does. Thanks to its easy operation, some editing jobs that seem professional can be done with ease. As general users, we also want to have the joyful experience, such as to create our unique watermark on video. Most free watermark software cannot meet our full demands, luckily here comes a good video watermark pro, idoo Video Editor. We often want to add watermarks to our family videos, to give them our unique logo, and we also want to highlight our personality and characteristics when share our videos on social networks. Obviously it is important to watermark video when share it. As beginners or enthusiasts, how to finish this job with ease? Please follow the tutorial below, and watermark your own videos. 2. Click Arrow2 to select the picture to add as watermark in your PC. 3. The information of the watermarks shows in the box (Arrow3&4). 4. The picture watermarks can be seen in the preview box (Arrow5&6). 5. The selected picture watermark info turns blue (Arrow7), and the borderline turns red at the same time (Arrow8). The position of watermark can be changed by directly dragging it. 6. Set the start and end time in Duration box (Arrow9), with millisecond precision. Change the transparence in Arrow10 area by inputting the numbers, or directly by dragging the slider below (Arrow11). 7. Edit the size of the watermark by adjusting the figures in the box (Arrow12). 8. Click “Default” (Arrow13) to cancel current operation and return to default settings. 9. Click “Start” (Arrow14) to begin editing. Then to check the output file or edit it. How to preview the videos when add the watermarks, and how to convert them into the format we want? How to add watermark to video and add more special effects? How to create a watermark and more special effects to video? How to watermark an image by time settings? How to add batch watermarks to video? How to watermark video? How to add watermark to video? how to cut wmv video? how to cut MP4 video? how to cut mov files? how to cut video clips? how to cut split video for YouTube? how to cut and effect video? how to easily cut AVI video? how to cut 3GP? How to convert and split video for MAC? How to split audio from video?